The aim of our experiment is to trap and manipulate free electrons on the surface of a structured microwave substrate. The electrons can be confined to one dimension using electrical fields, which are induced by microwave signals on the surface of the substrate. The electrons can be guided on the surface of the microwave substrate like being trapped inside a tube. The major motivation for this experiment is the study of the quantum mechanical wave nature of an electron inside a confining field and exploiting this for quantum experiments with electrons. 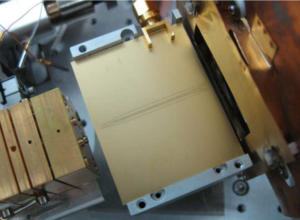 This technique would make compact interferometers for slow electrons possible, enabling the measurement of extremely small electrical fields, rotations etc. The basic principle of the electron guide is based on a linear Paul trap. Paul traps allow trapping of charged particles in a pure, alternating electrical field, until recently limited to ions. Field oscillations that are fast compared to the movement of the particle to be trapped result in a harmonic restoring force averaged over time. The restoring force always accelerates the particle to the minimum of the field and thereby enables stable confinement. Electrons react very fast to electrical fields due to their small mass. Therefore, high frequencies for changing the polarity of the electrical field are therefore necessary. Typical values for these frequencies are in the microwave regime between 1 GHz and 10 GHz. Ions on the other hand can already be trapped using significantly lower frequencies of several 10 MHz to 100 MHz. Electrons with an energy of 1 to 10 eV are injected at one end of the conductor and deflected in an angle of 30° by the curved electrodes. For this reason the guided electrons can be spatially separated from the unguided ones on the detector. Using this, we could show that Paul traps also work for electrons and that guiding of electrons in a two dimensional confinement really is possible [1,2]. 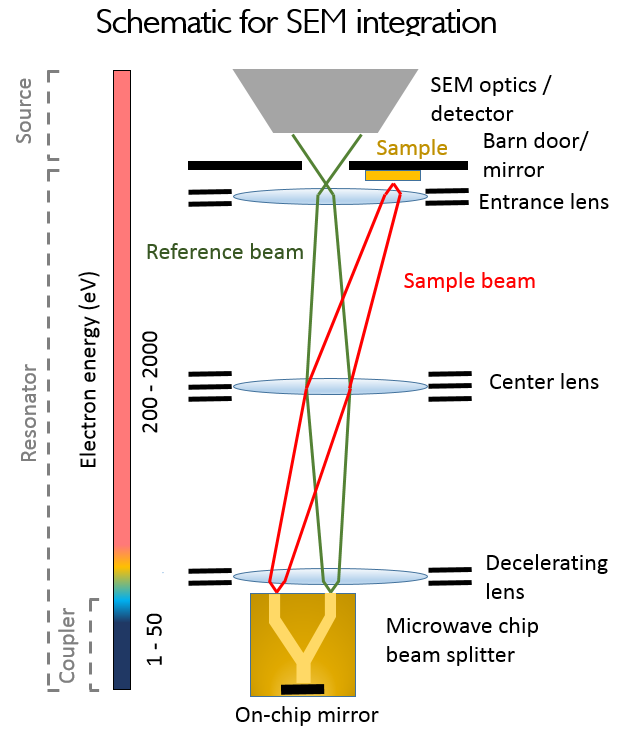 Electrons follow the curved microwave guide, when the microwave potential is switched on. 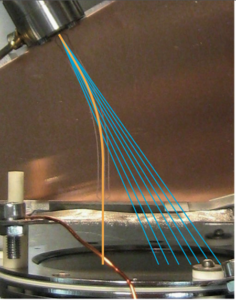 Using a diffraction-limited electron source we want to inject electron wave packages into specific transversal quantum mechanical states of motion of the linear Paul trap. These quantum states can be used as carriers of information in future experiments, such as in interference experiments. This goal in mind, we work on far more complicated trap geometries like beam splitters or resonators for electrons. In the future experiments on guided electrons could play a major role in the realization of a quantum electron microscope . This project is part of an international collaboration and is funded by the Gordon and Betty Moore foundation. Hoffrogge, Johannes; Fröhlich, Roman; Kasevich, Mark A.; Hommelhoff, Peter; Microwave guiding of electrons on a chip. Phys. Rev. Lett. 106, 193001 (2011). Hoffrogge, Johannes; Hommelhoff, Peter; Planar microwave structures for electron guiding. New J. Phys. 13, 095012 (2011). Putnam, W. P., Yanik, M. F. Noninvasive electron microscopy with interaction-free quantum measurements. Phys. Rev. A 80, 040902(R) (2009).